WSOP Circuit events attract players of different levels of skill. But they have one thing in common – they all love the game of poker. The latest tournament to be marked as complete took place Saturday as part of the ongoing WSOP Circuit Horseshoe Tunica stop. The event was a single-day $400 buy-in one and drew 252 entries who gathered at the tables of the host casino to challenge their skills and hopefully scoop a payout from the tournament. Once registration for the event was closed, organizers estimated that the overall prize pool amounted to $83,160. The money was distributed to the top 27 finishers, min-cashes worth $672. Benjamine Van Biljon from Palestine, Arkansas was the first player to leave with a payout from the tournament. Each of the ten finalists who set at the unofficial final table was guaranteed a minimum payout of $1,514. But everyone was vying for the first-place prize of $20,374 and the accompanying gold ring. It was eventually Richard Perkins, an anesthesiologist from Milwaukee, Wisconsin, who claimed the title and the piece of WSOP Circuit gold. The player’s road to victory met him with a number of more experienced contenders for the title, but the gold was his to capture. Perkins claimed last night his first-ever piece of WSOP-related jewelry and his first-ever cash from the WSOP Circuit. The first-place prize $20,374 Perkins rightfully won after outwitting the tournament’s field represented his largest-ever payout from a poker tournament. The eventual winner had to fight against Robert Lowry from Chesterfield, Virginia in a heads-up duel for the title. On what turned out to be the final hand of the night and of the tournament as a whole, Perkins tabled a winning [6c][5d] to send his final opponent to the rail and lock up the title, the top cash, and the gold ring. Lowry took home $12,589 for his runner-up finish. Commenting on his run in the $400 buy-in single-day No-Limit Hold’em tournament at Horseshoe Tunica, Perkins said that he just got lucky. He went on to explain that, in his view, luck plays an important part in how action unfolds at the table. The 52-year-old anesthesiologist also pointed out that he does not play the game for a living, although he is very passionate about it. Horseshoe Tunica is one of his favorite places to play the game he loves, it also became known from his interview last night. The casino is set to play host to the WSOP Circuit all the way through January 28 when the $1,700 Main Event will be completed. The post Richard Perkins Claims Gold Ring in WSOP Circuit Horseshoe Tunica $400 Buy-In Event appeared first on Casino News Daily. Vietnam’s first casino to allow locals to gamble opened doors this weekend in Phu Quoc, known to be the country’s largest island. Corona Resort and Casino is part of a larger ecotourism and entertainment complex. The property was built by Phu Quoc Tourism Investment and Development Jsc., a company half-owned by Vietnam’s largest conglomerate,Vingroup. The developer invested more than $2.1 billion into the luxury hotel and casino resort. Under a new, government-endorsed program, the Phu Quoc-based casino will allow locals to enter its premises and gamble during a three-year trial period. The three-year program aims to help Vietnamese lawmakers determine whether residents should be allowed to gamble at local casinos permanently. The property features a 30,000-square-meter casino floor with more than 200 gaming tables and well over 2,000 slot machines. News emerged late last year that Vietnam’s coastal province of Quang Ninh is seeking permission to build a $2-billion resort with a casino that will allow locals to gamble. The property will be built in the Van Don district, which has been looking to attract investment and become a major tourism and industrial boon. According to initial plans, the Van Don casino resort will spread over 2,500 hectares of land and will be built and launched in several phases, with phase one hoped to become operational in the first quarter of the year. The major complex is projected to be completed and fully operational by 2022. Developers aim to secure a 50-year gaming license for their property. As mentioned earlier, the property, if approved, will too be part of the government’s three-year trial program and will admit Vietnamese passport holders to its gaming floor. According to early projections, once fully operational, the resort will inject VND250 billion (approximately $11 million) into the nation’s economy every year. 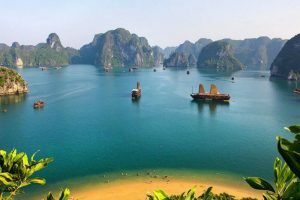 The post Vietnam’s First Casino to Allow Locals to Gamble Now Operational appeared first on Casino News Daily.